A French single-malt whisky finished in used Cognac barrels-tastes like a soft, golden Speyside Scotch with a little something extra. Honey, apricot and creme brulee kick into a spicy ginger and black pepper finish and a gentle puff of smoke. 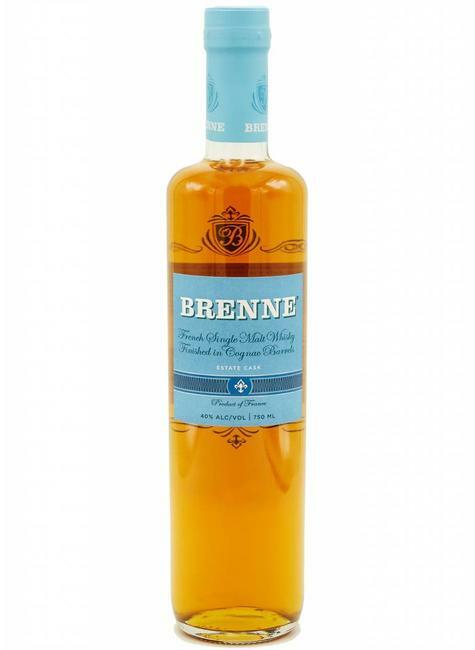 Aged in French oak and cognac barrels Brenne Whisky starts in new Limousin oak barrels before being finished in Cognac casks, giving it a hint of perfumed fruit that sets it apart from other whiskies. Single cask bottles, each bottle of Brenne Whisky comes from a single barrel selected at its peak. We don’t blend barrels. Each barrel number is stamped on the back label. Cognac distilling technique is used, cool fermentation and small batch production, Brenne Whisky is twice distilled in copper alembic stills for a smooth finish. No age statement Because Brenne Estate Cask is bottled individually by barrel, the aging for each cask differs as it depends on how long the Cognac was in the barrel before. On average, the whisky ages for a total of about 7 years.